On 11.06.2015, Serbian President Tomislav Nikolic met in Baku with President of the Republic of Azerbaijan, Ilham Alijev. Before the conversation, President Tomislav Nikolic presented to Azerbaijan`s first lady, president of the Heydar Aliyev Foundation Mehriban Aliyeva Sretenski Order of the second degree , a high state award of the Republic of Serbia, for special merits for the Republic of Serbia and its citizens for the activities in the public, cultural and humanitarian areas. 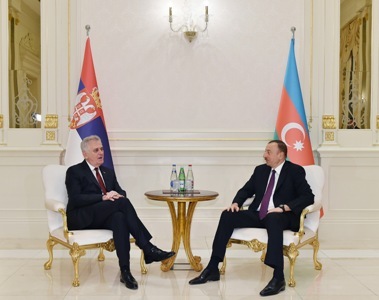 The two presidents expressed satisfaction with the successful development of the relations between Serbia and Azerbaijan in a variety of fields, including politics, economy and energy. They agreed that the two countries can achieve significant results together. Also, presidents Nikolic and Aliyev discussed several joint projects that should be realized by the two countries. President of the Republic of Serbia Tomislav Nikolic invited the President of the Republic of Azerbaijan to visit Serbia. On 12.06.2015, After the meeting, Nikolic had talks with Azerbaijani Minister of Trade and Economic Cooperation Shahin Mustafayev. The discussion covered the construction of the beltway around Belgrade, privatization of companies MKS from Kikinda and the Agricultural Combine PKB, as well as Azerbaijan's investments in the spa tourism in Serbia. Nikolic presented Mustafayev with documentation on the projects and underscored that Serbia wants the projects to be realised within the shortest possible deadline, according to a statement from the meeting. During his stay in Baku, Nikolic visited Serbian athletes participating in the first European Games due to begin on Friday, which will last until June 28.